For installation you will need: Household Rubbing Alcohol, a soapy water mixture of one full spray bottle of water and a couple of drops of baby shampoo or mild dish detergent. WARNING: It is very important to follow every step without skipping anything. This will ensure that you mount your lens guards professionally. 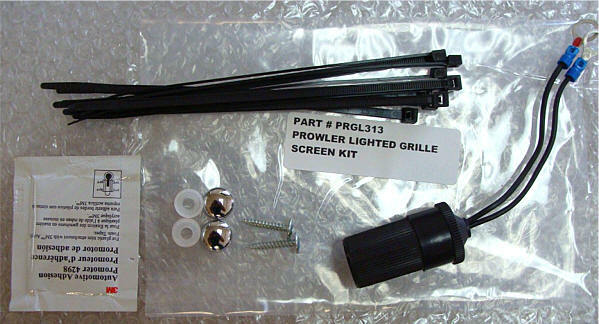 This kit is a special bug screen that has been made specifically for this application and comes to you with a custom lighting system especially designed for the unique shape of the prowler grill. In the next few paragraphs we will guide you through a simple installation that will protect and transform your prowler into a show car. 1. The first step for this kit will be to install the electronics package. To do this you will need to remove the factory grill. This is very simple and you will begin by removing the three Philips head screws securing the top of the grille to grille support rail. Remove the two screws just behind the grille that secure the grilles center support bars to the cars inner frame. 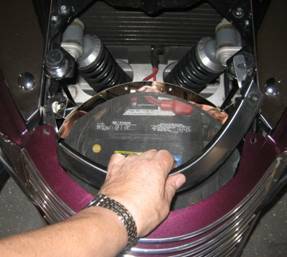 Gently pull the top of the grille forward as you push in at the bottom of the grille back slightly so as to allow the grille to detach from the prowler nose. You will need to manipulate the two side support bars so they don’t get caught on the nose rim. 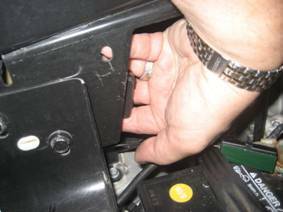 Remove the two remaining screws that attach the grille support rail and set aside the rail and screws for later. 2. Now that the grille is out of the way, we can install all the electronics. You have been provided with a fuse socket that sort of looks like a cigarette lighter socket. This socket contains two attachable wires. Look closely at the wires and you will notice that one of them will contain a white stripe running along its length or it may contain an eyelet that is colored red. 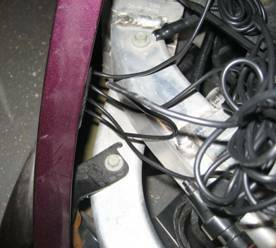 This wire lead will need to be connected directly to the batteries positive post terminal bolt by removing the factory nut placing the eyelet over the bolt and replacing the nut. 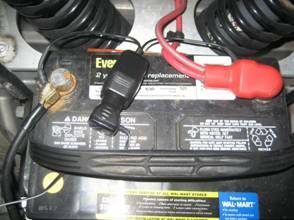 Do the same for the negative side of the battery with the remaining wire. 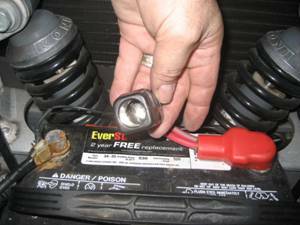 This socket will serve as a quick disconnect point for the long term storage of your prowler. See Pic #1 Leaving the system connected will allow the electronics to stand ready to receive your commands from the remote. 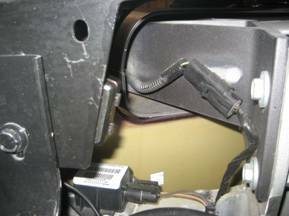 See Pic #2 Although the system requires less power then the factory keyless entry system, we have provided this disconnect socket to eliminate any unnecessary power drain during long term storage. 3. In order to install the main system you will need to prepare two areas for the system to attach to. 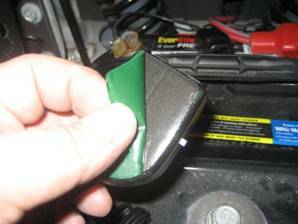 Thoroughly scrub clean the outer side of the prowlers front nose frame just to the left of the battery with household rubbing alcohol. Also scrub clean the left inner side of the front nose ridge that the factory grille sits against. Once this is done swipe the two areas just once with the adhesive promoter pack provided. These two areas will provide an adequate weather shield location for the electronics. 4. Leaving all the wire bundles tied remove the release liner from the back of the main receiver unit and mount it to the outer frame you have just prepared in such a way as to allow the manual control buttons to face down slightly. See Pic #3 & 4. Press firmly to set. 5. 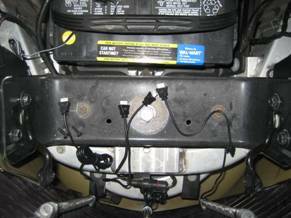 Remove the release liner from the back of the smaller wire harness module and mount it to the back side of the nose ridge and press firmly to set. You have now completed the installation of the main electronics package. Pull a small length of the fuse holders wire from the tied bundle just enough to reach the fuse socket installed earlier and insert the fuse holder into the fuse socket. 6. The next step will be to mount the led tubes to the factory grille. Thoroughly clean the back of the grill with alcohol then swipe the three vertical rails once with the remaining adhesive promoter. It is these three vertical rails that we will mount our LED lights to. You will notice that there are two long LED'S and two shorter ones. Mount the two longer at the two side rails so that the wire will run to the bottom of the grille and set the tube so that it can be strapped to the grille with the zip ties provided. WE will NOT use the zip ties just yet. In order to set the tubes peel the green release liner from the back of the tube and stick them to the grille rails leaning towards the bottom of the grille just between the horizontal slats of the grille. This will allow you to strap the tubes later at just the right position. 8. You have been provided with two long zip ties for each of the four tubes. Secure each tube by lashing the tubes to the vertical rails they are stuck to. For the best results make sure the head of the zip ties face the front of the grille in such a way as to be tucked under the horizontal rail. Then trim the excess tie using an 'exacto' knife. If done correctly the head of the tie will not be visible when the grill is set in position. See Pic #6 for the over position of the tubes and zip ties. 9. Now that all the tubes have been secured make sure that each tube faces toward the REAR of the car when the grille is back in position and not towards the front of the car. You will notice that the tubes wire connectors will need to insert into the module have a couple of small ridges in them. Align these ridges with the module so as to allow you to insert all four LED cables. See Pic #7. Once this is done place the grille back onto the front nose being careful to manipulate the side bars so they don't scratch the paint. Once in position install the two screws securing the two side bars. 10. The next step will be to install the key element for this kit and that is the bug screen and light reflector. 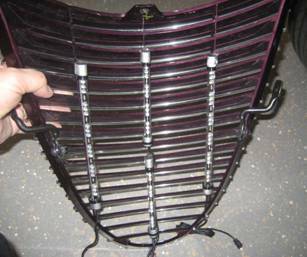 It is this single part that will protect your radiator from bugs and debris and will serve as a light generator forcing the collective illumination of all the LED'S forward creating an awesome grille light display. 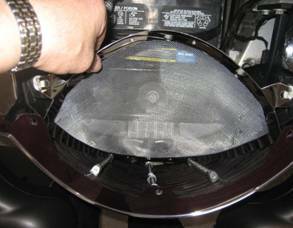 Gently slide the reflector down in back of the grille so that it sits between the grille and side bars you just secured. See Pic #8. Shape the reflector so that the two tabs of the reflector align with the two screw hole locations of the grille support rail. 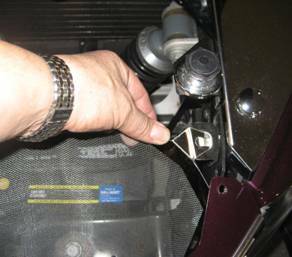 Although it should not be necessary you may need to make this adjustment using pliers depending on your car so that the reflector is seated nice and flush with the screw holes. Once this is done reposition the grille support rail and install the three front screws of the grille. See Pic #9. Be sure that the support rail sits on top of the reflector tabs. Once this is done set the final top plate of the kit over the two holes and reinstall the two remaining screws to finish the installation. See Pic #10. 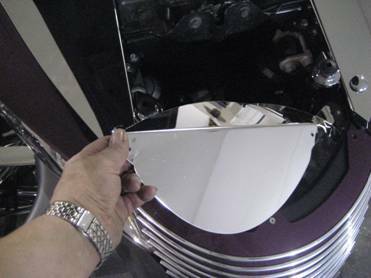 A properly installed kit will set the reflector completely under the top plate creating a nice finished custom look. 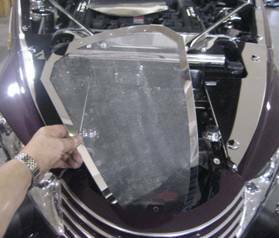 This plate can easily be removed to allow you to remove any bugs or debris that may collect at the screen. Any such debris will need to be kept clear in order to provide you with the best possible illumination. For Additional Installation Pictures see website.